The Blue Devils got off to a great start to the 2012 season with a big win over FIU in week 1. 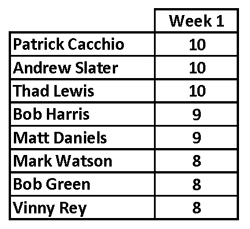 BDN's college football picks were equally impressive, as Thad Lewis, Andrew Slater, and Patrick Cacchio all posted perfect weeks. Overall, the BDN Staff are even with the BDN Greats with both teams knotted at 36 points heading into week 2 action. Week 2 has another tough set of games, headlined by Duke's west coast trip to take on the #21 Stanford Cardinal. The Blue Devils posted a convincing win over FIU while Stanford struggled with San Jose State in their respective openers. The Blue Devil Greats are confident that Duke is ready to pull off the upset in Palo Alto. In another pairing of top academic schools, James Franklin will take his Vanderbilt squad north to take on Pat Fitzgerald's Northwestern team. The ACC will take on teams from the Big 10, Big 12, Big East, and PAC-12 this week. UNC travels to Winston-Salem for their ACC opener against in-state rival Wake Forest. And finally, Texas A&M and Missouri will make their SEC debuts against Florida and Georgia, respectively. 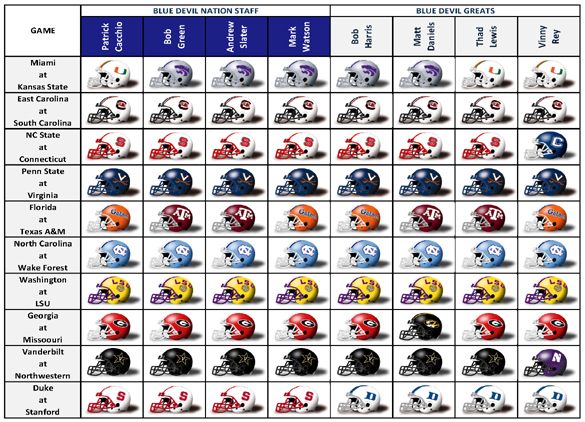 It should all shape up to be another exciting weekend of college football! Patrick Cacchio: The Cardinal no longer boast an offensive juggernaut led by Andrew Luck, but Stepfan Taylor still will prove a tough test for the Duke front six. Stanford's defense held the Blue Devils in check in 2011 and will be every bit as physical in 2012. Stanford is more vulnerable than a year ago and Sean Renfree leads a more confident Duke team, but the Cardinal program remain a year or two ahead of the Blue Devils in overall talent. Stanford 28, Duke 20. Bob Green: The last time Duke traveled to the West Coast to face Stanford, in 1971, they came home with a 9-3 victory. Last season, Stanford traveled to Durham and beat down Duke 44-14. This week's game will not feature the 1971 Duke team or the 2011 Stanford team. It is a new season and I expect this game to be competitive for four quarters. In the end, it will come down to turnovers, penalties and mistakes. The team that limits those items will win. In the final analysis, I believe the home field advantage will be enough to push Stanford to a win. Stanford 35, Duke 31. Bob Harris: Duke 28 - Stanford 24. Need I say more??? Duke builds off the 20 point win to open the season. Stanford had trouble with former Duke Asst Mike MacIntyre's team, San Jose St., 20-17. Matt Daniels: Coming off of a huge victory vs the Panthers the Blue Devils look to take that momentum out West to face the Stanford Cardinals. The offense seems to have things clicking with the WR tandem of Conner Vernon and Jamison Crowder; look for those two to have big games and for the Duke defense to heavily pressure the new starting Cardinal QB. Duke wins 27-21 in a thriller.